What is a successful blogger? Are you one? What separates successful bloggers from the rest of us? December 2016 marked the end of one year of blogging for me. 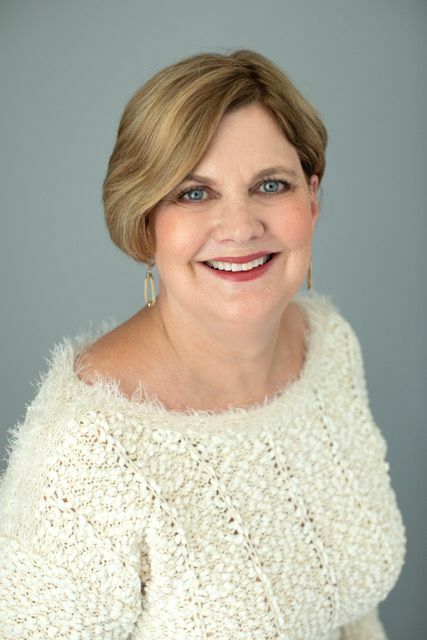 My blog, MySideof50.com, is a lifestyle blog for midlife women. I LOVE writing for it, promoting it, talking about it, learning how to do it better EVERY DAY. But as anyone who has been in the “blogging biz” longer than a few months knows – there’s a lot more to blogging than writing. There is hosting, your platform, security, photography, graphic design and social media to tackle. 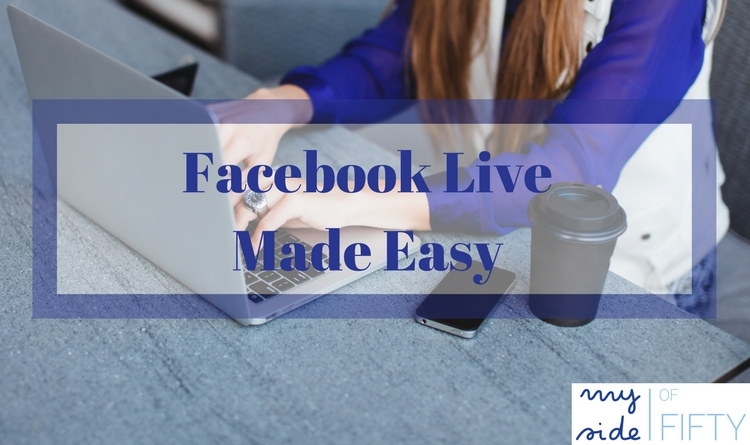 There are conferences and courses and Facebook groups. There is backlinking and SEO and creating the PERFECT PIN. There is your newsletter and live video. It’s exhausting. And as a new blogger, I TRIED each and every one of those things. That was certainly appropriate. But beyond the “trying them”, I never took the time to evaluate how any of these things were moving me toward my goals. What they actually became was one long TO DO LIST and was getting totally burned out. I lined up some guest posters for my blog and took a few weeks off. 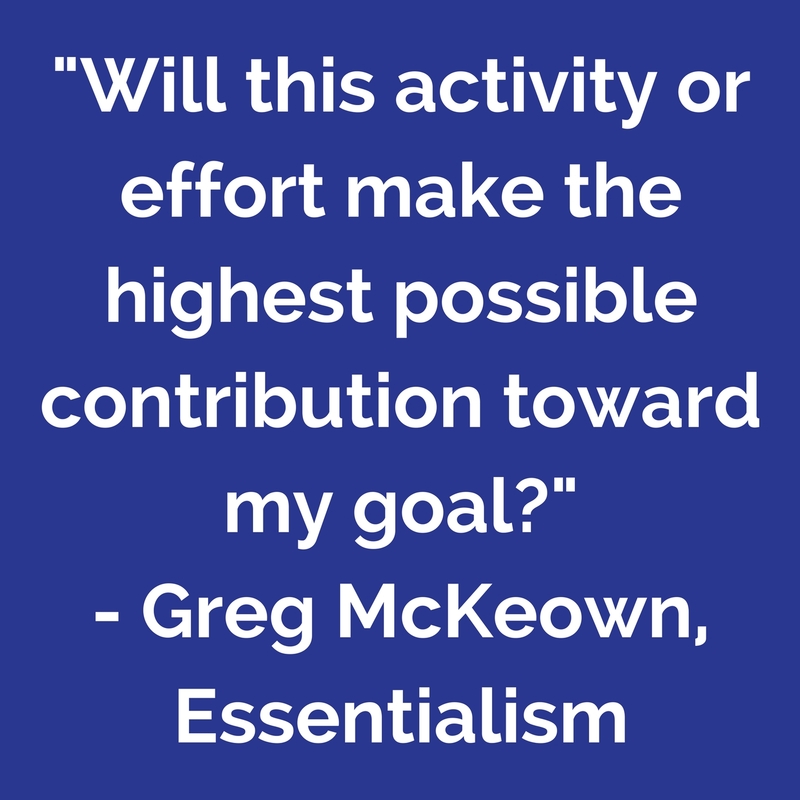 Read the book Essentialism: The Disciplined Pursuit of Less by Greg McKeown, which I highly recommend to everyone, including bloggers who are serial “I must do it all to succeed type folks”. By the way – I am the president of THAT club! When I began the MySideof50 blog, I was passionate about writing on topics of interest to mid-life women. Caring for aging parents, the empty nest, health & wellness, fashion and travel. And I am still passionate about those things. But I was just doing it for fun. As I learned more about blogging and started actually paying for things that would support my blog, I became interested in monetization. So my goal for 2017 is to make enough income from my blog to cover my costs. What do you want your blog to do? Drive people to your brick and mortar business? Get you clients for a service you offer? Attract companies that will pay you for sponsored posts? Give you visibility in a certain niche? Support your reputation as an expert in your field? Gain readers for your books? Connect you with others who have your same interests? Offer inspiration and hope to as many people as possible within a certain community? The possibilities for your blog are endless. That’s why blogging is such a fun and creative endeavor. And you don’t have to set one goal and stay with it forever. As we grow and change in our lives, so do our blogs. And that is perfectly OK. The point is to set a goal and do only those activities that support that goal. Many of us start out without a goal or with one goal and change it later. That is OK. The important thing is to know what you are trying to accomplish with your blog NOW and focus on activities that will support that goal. Successful Bloggers Action Step 1: Decide what you want your blog to do and set a goal. The Top Ten – In the last year, which 10 posts had the MOST page views. The NOT Top Ten – Which 10 posts had the least page views. Traffic – What were the top 5 sources of traffic to my blog? Facebook? Pinterest? Search engines? Other blogging sites? You get the idea. My results were surprising. Some of the posts that I JUST LOVED, had the lowest number of page views. Some that I thought were just OK, received lots of views. But the numbers don’t lie. This exercise showed me what my readers were interested in. So if I wanted to increase page views (which was important to me for my goal of monetizing), I needed to hone in on these interests and produce more content! DISCLAIMER – Your goal may not be increased page views! And that is OK. I only give this as an example of what I was looking at and how I had to evaluate it going forward for MY blogging goals. I also discovered that most of my traffic came from Facebook and Pinterest. That’s where my readers were. So I made the decision to focus my efforts on those two social media sites, learn all that I could about them and maximize my efforts there. Now, this could have gone a totally different way, depending on my goals. I did not get a lot of traffic from Instagram, so I decided to leave that platform out of my strategy this year. But if my goal was to get the attention of brands for sponsored posts, I may have looked at those same numbers and said, “Boy, I really need to up my Instagram game”. So again – your plan is determined by your blogging goal. Evaluate this information, then make a plan based on what you need to focus on to meet your goals. Based on your evaluation, ELIMINATE those activities that AREN’T giving you LARGE GAINS toward meeting your goals. I looked at where my traffic was coming from and eliminated anything that wasn’t in the top 10 traffic drivers to my site. That was hard. I chose to eliminate submitting to some big sites in my niche that weren’t sending traffic my way. Even though they might give me “exposure”. In my experience “exposure” doesn’t always lead to page views or income. I chose to drop a link party that I enjoyed co-hosting because it wasn’t driving traffic to my site. I chose to quit signing up for every webinar and course that came my way and instead choose only those courses that would help me achieve my goals and enhance my learning in my areas of focus. Successful Bloggers Action Step #3: Write down the things that you are doing now that are NOT moving you toward your goals. That means even the things that you think “Oh, that doesn’t take much time.” Why? Because all those LITTLE things that “don’t take up too much time” add up. 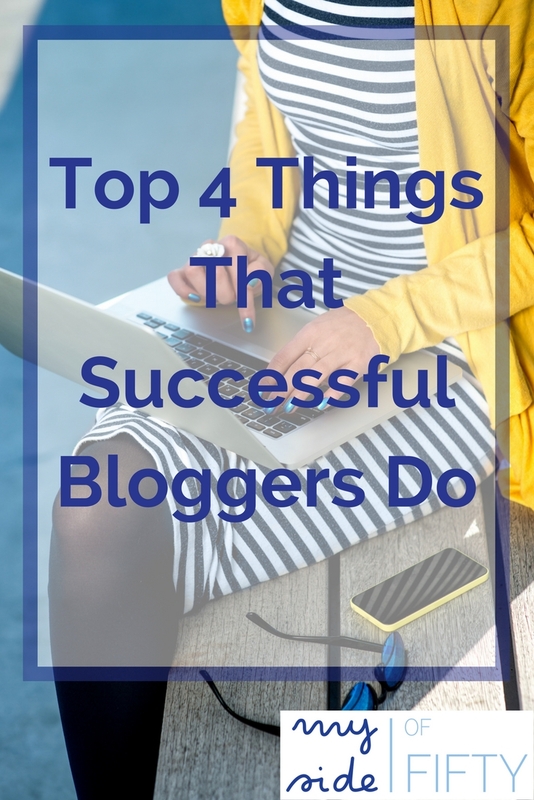 #4 Successful Bloggers Work Toward Their Goals in the Most Efficient Way Possible. Reaching our goals in the most efficient way possible means not always doing everything manually or doing everything yourself. Automate tasks that can be automated. And hire help for those tasks that can be delegated or aren’t in your wheelhouse. Automate my Social Media using Buffer, Tailwind and Social Jukebox. Switched from MailChimp to ConvertKit. In 2017, I added blogging tips to my categories of posts. Bloggers reading those are different from the MySideof50 audience. ConvertKit allows me to target specific people in my audience depending on the topic I am blogging about. Hired a Virtual Assistant to create social media graphics and other time-consuming tasks. I stink at social media graphics. My VA is good at that. And because she is good at that, it takes her 15 minutes to do well what it takes me an hour to do poorly. So when you balk at paying someone an hourly rate to help you, remember that someone who knows what they are doing can do things in less time than you can. You’ll be surprised at how little hiring a VA can cost. Successful Bloggers Action Step #4: Decide which blogging tasks you can automate or delegate. Take a look at all your blogging tasks. Which ones don’t you enjoy? Which ones are the most time consuming? Which ones can you automate? Which ones can you delegate? Make a list and find tools and people to support your efforts. 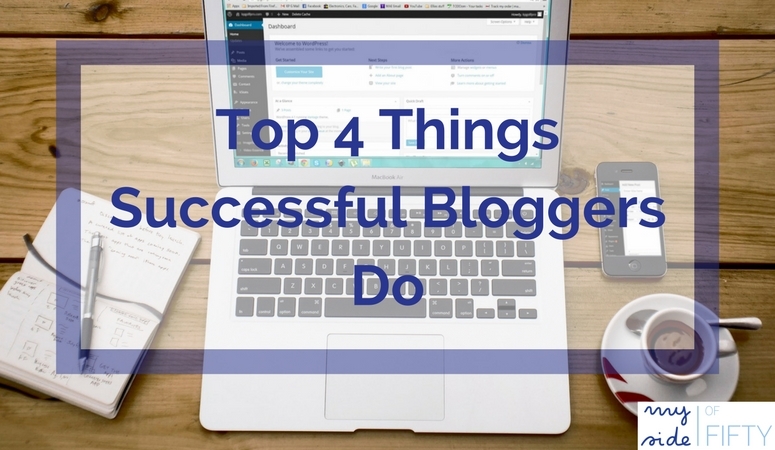 You can have a blog that meets your blogging goals without doing “all the things”. You can have a blog that meets your goals and have a life. It’s called #BloggerSmarter. Love a Blog? Do This – Subscribe! Love A Blog? Do This-Comment! This is great advice Cathy! There are some things that I need to stop doing so that I can quit chasing my tail. This is a great post! I’m a VA and web designer and saving time, setting goals, and keeping track are all key elements. I love the way you explained actionable steps that people can take. I wrote a post a couple of weeks ago about revising old posts on my The Diary of An Alzheimer’s Caregiver site and it has made a huge difference in my page views. Great tips Cathy. It’s common sense – don’t fix what isn’t broke, and get rid of the rest! Man, this really speaks volumes to me, Cathy!! I’m one of those that once I start doing it, I feel the need to continue. And it’s probably not doing me any good (or how would I know if I don’t evaluate it?). My first time on your blog and I found this post so useful. I relaunched my blog a few months ago and have been running around like a headless chicken trying to do everything. I’ll take stock and assess what works well and what my priorities should be. Wow, thanks to your advise I found that most of my highest-viewed posts were responses to the WordPress Photo Challenge! This is an excellent post Cathy and congratulations on such a successful first year. I can learn a lot just from this post so thank you! Thank you also for sharing with us at #OvertheMoon Link Party. I think a big problem for bloggers is feeling they have to link up to many parties and also be part of so many groups that you just don’t have time to give your best to. that has been one of my problems so cutting back isn’t necessarily a bad thing as you point out. The one about eliminating things that don’t work and take up time anyway is so true Cathy! Thanks for the great tips Cathy! I really enjoyed the post, I struggle daily trying to get everything done. I will be taking your advice, and eliminate what’s not working and work more on what is. Wendy | The Art of \"Why Not?\"
Cathy, these are fantastic tips. When I began blogging, I did none of these, I just wrote and expected to be “found”. A few years in I was made aware of all the things, and so I started doing all the things. Talk about a year of complete burnout, subpar posts and sporadic promotion. Now I am working to evaluate each area, and to spend more time writing posts that will do work for me and promoting. I need to get better on the promoting, but I’m working on that! LOL Thanks! Great info Cathy. I bookmarked these and am following on Facebook. Thanks for the wonderful tips!!! Yea – thanks so much, Marilyn! Exciting! This very sensible advice. It’s funny how as bloggers we start chasing the carrot of more traffic or whatever without really thinking about setting goals first. I’ll be sharing this with my blogging group. Coming over from the Blogger’s Pit Stop! Menaka, – glad you found the post helpful. I have to read it myself as a reminder! LOL! Great article Cathy; I agree with your tips. Stumbled. Do you blog about blogging now? You have accomplished more in a year than I did in five. I am not making any money and just can’t justify paying VA to help me out. You made some great points though, and I need to start “spring cleaning”. Have a wonderful week, Cathy! These are all great tips and ideas! I have to laugh though, today I blogged about kind of the opposite, how I’m kind of getting back to blogging for me and not for what everyone else is doing – but that’s just what works for me. Everyone is different in their approach and that is what makes blogging so wonderful! Beth – you are so right. We are all in different places with out blogs. And what works for me might not work for you. And things are always changing. That’s what makes blogging so fun (and sometimes infuriating)! Thanks for all the great advice. It sounds like 2017 will really be the year for you and your blog! I’ve definitely been working more on trying to figure out what works for my blog and finding ways to grow my readership. So far so good! Isn’t that the endless task – finding what works and growing our readership? LOL! Thanks for these awesome tips. I really like your advice to break down 10 most popular, 10 least popular and 5 best sources of traffic. It can be a little overwhelming at times to know what to concentrate on – I’m looking forward to taking some of your suggestions on board! Dominique – I felt the same way. Taking the time to figure out what was working helped me to really focus on the things that are the best use of my time. I hope this will be helpful to you too! These are such great tips! It’s so important to know how to check/read your analytics to determine what people love and don’t love about what you post. So true, Alexis. Otherwise we are just guessing. Great post Cathy!!! You u shared so much useful information and I especially liked what you said about looking at you least popular posts. Onc I get enough posts out there I’m going to really pay attention to that advice. I subscribed to your blogging newsletter and Facebook page too. Dianna – glad you found the post helpful! That was such a good exercise for me to do too. Glad to have you as a subscriber. Great advice! After getting so overwhelmed trying to do to much, I have finally cut my social media to two platforms as well. It is more manageable now, and I have quit signing up for webinar. I’m still working through courses, so won’t be signing up for any of those either. I’m still working on my action plan, but at least I feel like I am finally getting things more under control. Love this post. Currently working on setting goals and finding my readers. I’m a newbie blogger trying to figure it all out. Yes I sign up for too many webinars and courses then feel overwhelmed. Great tips. I think as you grow and evaluate your goals shift and change. Being tough and evaluating is important as you point out some things you enjoyed you had to give up because the ROI was not there! I’m guessing successful bloggers don’t constantly lose their planner and then get distracted by Facebook….oh, right, that’s me. 🙂 Thank you for the great tips! This post is very timely for me and I started a version of my blog in 2010! I’ve been thinking I need to do something and this post has given me a roadmap of where to start. Better late than never, right? Great advice, some that I will be sharing in my workshops for newbie bloggers. 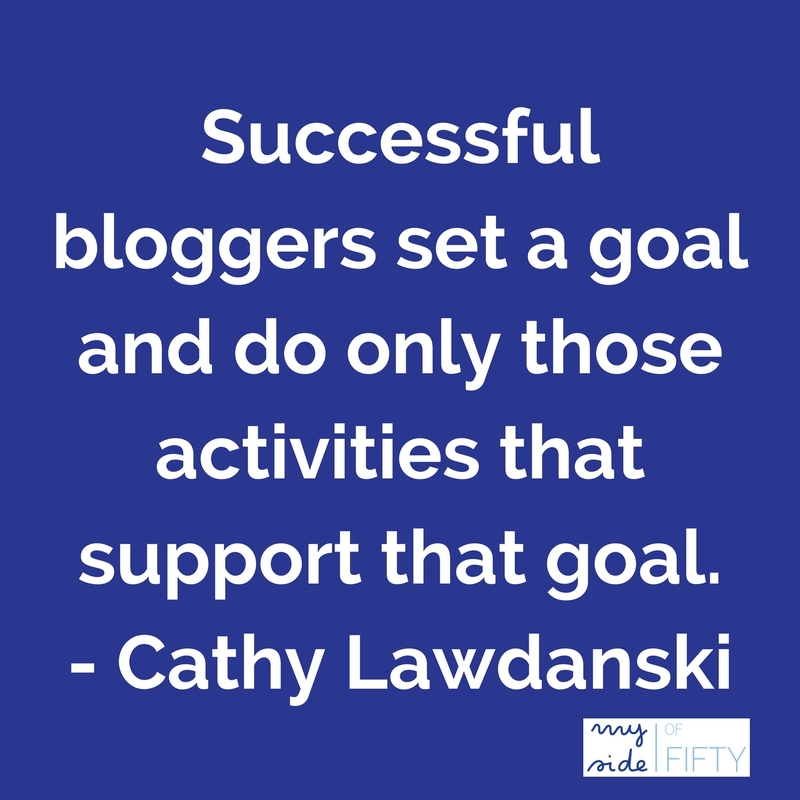 Most of the bloggers I know started with one goal and changed their focus as their blog evolved. Great advice here, we learn as we go. Thank you for all your advice. I am a new blogger and feeling my way around right now. I will try to focus on specific goals now that I have read your post. Where do you find your 10 most popular post at Google Analytics? I usually look at my WordPress dashboard for that. I agree with your tips for success. I’ve been blogging for over 5 years, and this year, I decided to launch my website and put less emphasis on the blog. For myself, I learned the blog is a tool and not a business model. Thank you so much for the tips! This was very helpful and I needed this. Stopped by from the bloggers pit stop! You’re right Cathy, it is exhausting. I’m still trying to find ways to fit in all there is to do with blogging along with all the things I need to do in the real world. So far, sadly, the blog is losing out. Thanks so very much for your great tips. Very much appreciate all these ideas to remain on task to try & met goals. This is awesome, Cathy!! Moving overseas, I’m toying with the idea of blogging just to keep people apprised of my activities – this gives me a priority list of things to think about first!! Thanks! You’ve packed a powerful punch in this blog post which provides wisdom that cuts across all blogging niches. Thanks for the apt reminder. The first thing is the definitely the most important one. You can’t be successful if you don’t even know what success means to you. I will be sharing this on Pinterest and Twitter. Greetings from the Blogger’s Pit Stop! Great advice for bloggers. I Decided making $ was not a goal, although I do so indirectly with sponsored posts, Word ads and via self publishing. My blog has spurred my love for photography, so I look for photo challenges in which to participate. Great info, Kathy, and hope your Fall is off to a great start!